Using your computer you can calculate your electrical bills using the power of the Microsoft Office Excel 2007. Installed in your computer system unit(CPU). In this application to calculate this electrical bills, you need first to create a worksheet’s table then input your worksheet data to be calculated. This application of the Microsoft excel 2007, this is better if in your area, your are using a solar panels that you officially own or you’re the property owner. And there are plenty of your customers connected to your electricity using the solar system as your source of electrical power. You can calculate its of power consumption and how much they will pay every month. Create your worksheets table with worksheet’s title above and input this following worksheet’s label: House No., House Owner, Previous Unit, Current Units, Unit Consumes, Electrical Charges, Surcharge, Bill Payable, Status. Unit consumes- it is the current units minus the previous unit. It is calculated base of the unit consumes equals the electrical charges. 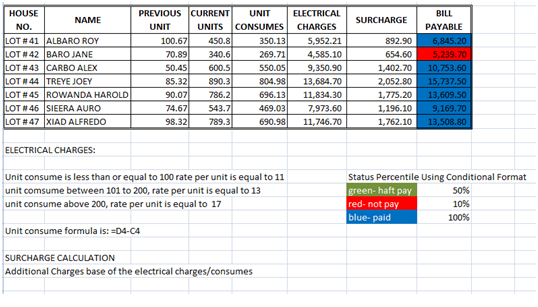 SURCHARGE CALCULATION-it is the electrical charges multiply to the percentage of the electrical additional charges. Then under the minimum click/select percent, then input the percentage given above. Review your worksheets if the calculation is all correct and the status if the color is applied to the exact payment if it is paid, haft paid, and full paid. See the post picture above. If you have any questions regarding this application kindly leave it in the comment bar. See you next post.